Do you have a dream for starting a new business, community, or ministry? Learn how with the next John Maxwell Course! Put Your Dream to the Test provides a step-by-steo action plan that you can start using to see, own, and reach your dream. Don't leave your dream to chance! 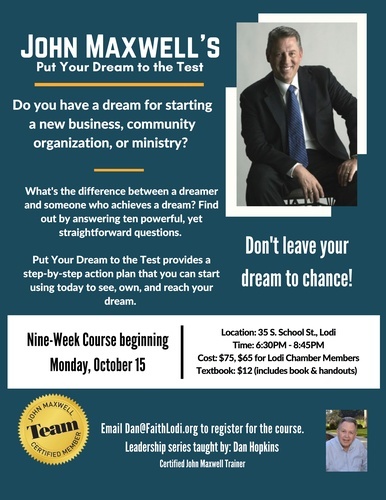 The nine week course begins Monday, October 15 in the Lodi Chamber Conference Room. Registration costs $75, $65 for Chamber Members. Email Dan Hopkins at Dan@FaithLodi.org to reserve your spot.